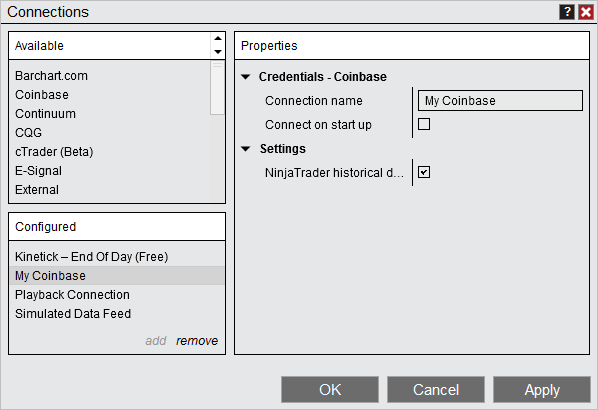 To connect to your account, go to the NinjaTrader Control Center window, select the menu "Connections" and then select your account “Connection name” you configured during step 6. Once connected, you will see your connection highlighted in the connections menu per provider. There is also an aggregated connection status in the bottom left hand corner of the Control Center. For more information please see the "Connection Status" section of the help guide. The Coinbase connection supports historical daily and minute data. Historical tick data is not supported at this time. 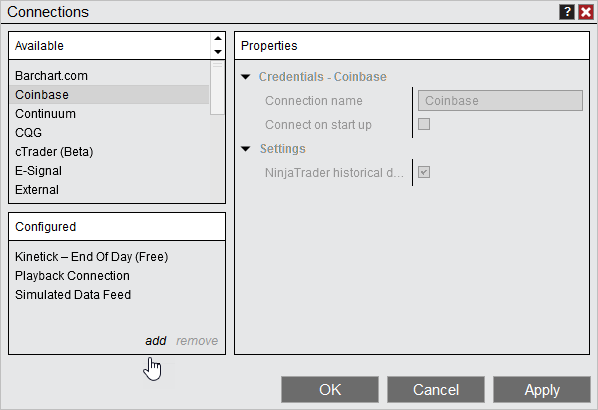 NinjaTrader Brokerage IS A MEMBER OF NFA AND IS SUBJECT TO NFA’S REGULATORY OVERSIGHT AND EXAMINATIONS. HOWEVER, YOU SHOULD BE AWARE THAT NFA DOES NOT HAVE REGULATORY OVERSIGHT AUTHORITY OVER UNDERLYING OR SPOT VIRTUAL CURRENCY PRODUCTS OR TRANSACTIONS OR VIRTUAL CURRENCY EXCHANGES, CUSTODIANS OR MARKETS. View NFA & CFTC advisories as they contain more information on the risks associated with trading virtual currencies.